How many of you can use a day off? I know I sure can! 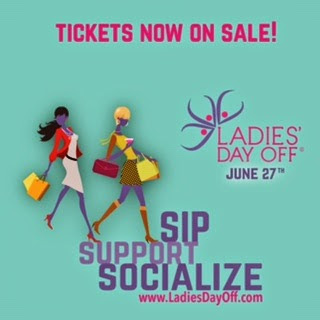 Well, you’re in luck because Ladies Day Off is coming back to Jacksonville on June 27th for another day jam packed with much needed relaxation!!! I had the pleasure of attending the event last year at the beautiful Queens Harbour and it was definitely an event you didn’t want to miss! Check out all the fun from last year here! Our job as women is never done so this event is the perfect get away from the everyday hustle and bustle! Come out between 12pm-4pm and enjoy the “Ultimate VIP Experience” with gourmet butler passed hors d’oeuvres, chilled wine, sweets, on-site mini-spa services, make-up demos, amazing giveaways, and much more! The event is happening at the beautiful Queen’s Harbour Yacht and Country Club!!! I’ve been there before for a wedding and I could not think of a nicer location to spend a day of much needed pampering! I have more good news! One of my beautiful followers can win a VIP ticket to the event! 1.) Simply comment below telling me why you could use a day off!!!! 2.) Follow myself (@willworkforheels) and Ladies Day Off (@ladiesdayoff) on Instagram. on the Ladies Day Off website here ! I hope to see all of your beautiful faces June 27th! It looks like a fun event; great giveaway. Whew do I need a day off!! I work full time, edit a personal style blog, mom to 2 little people both who have special needs…do I need to go on? I could use a day just for me to enjoy good food and even better company!